I have often been asked by a client to help resolve inefficient unit heater applications. Typically, we find unit heaters mounted about 8′–10′ off the floor in a room with 14′–26′ (or higher) ceilings. 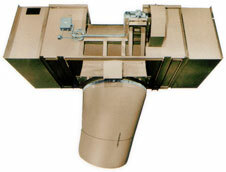 In most of these cases the heater is a horizontal flow heater mounted so that the air is basically blowing horizontally, or at best at a 10–15 degree angle. Said customer typically finds fault in the heater. It either isn’t strong enough, needs more fan power or needs greater BTU capacity. And while that may be the case, it’s typically not the real problem. The problem is stratification. The heater is mounted at a height wherein the heat it produces never reaches the level of employees in the space. Heat rises, and a heater mounted above 7′ off the floor will do a great job of heating the upper reaches of the space, but very little for the first six foot above the floor, where it is often needed the most. Of course, we can’t always blame the customer’s choice of mounting height. Generally, heaters need to be mounted so they don’t interfere with production. They need to be away from processes, personnel, fork lifts, etc… So, what to do? Often the solution for this type situation is to utilize high-mount, vertical flow heaters. Such heaters are typically mounted in the ceiling and designed to have enough air flow and throw to reach the floor with a decent enough velocity, and then recirculate the heat that rises back down through the heater again. Basically, it’s a vertical air rotation unit. RJ Owen Associates utilizes the LJ Wing High-Mount Unit Heaters for these applications. We can apply these heaters with gas, hot water, and steam heating media. Depending on the specific situation, these heaters work at heights up to 87′. We often utilize them in aviation hangars. But they are obviously not limited to extreme heights either. There are selections that work well in light manufacturing and commercial warehouses as well. The bottom line is we can find a way to optimize the environmental control of your space. Correctly designed, selected, and installed vertical flow unit heaters not only work well in distributing heat in a given space, they conserve energy in the process by ensuring adequate coverage, destratification, and temperature control. If you are going to make an investment to heat your workspace, consider your options, make sure you are getting the best return on your investment.